Hurry, last days! 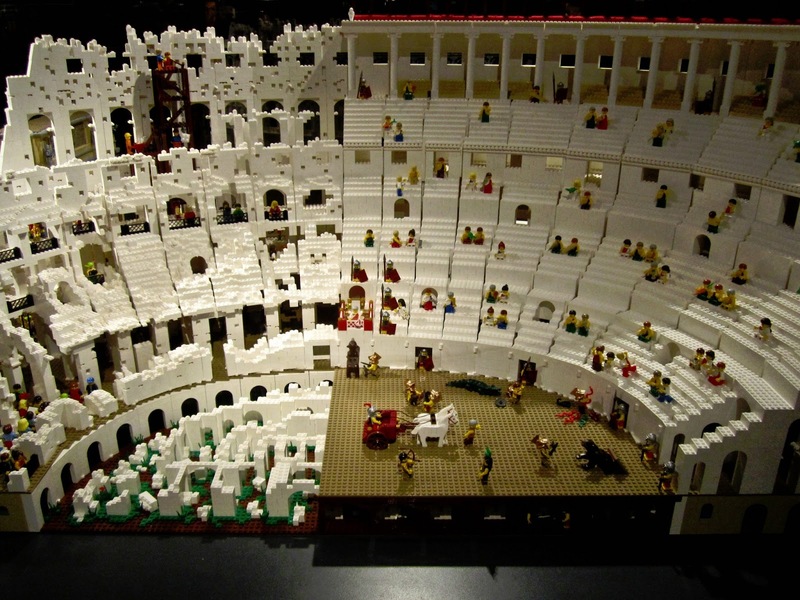 If you want to see the Colosseum before it's dismantled at the end of February then now's your chance. 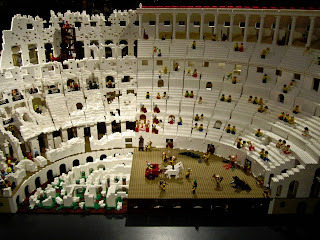 This isn't, of course, the Roman entertainment centre of old but its brilliant re-creation, the "Legosseum" of Lego-master Ryan McNaught of the City of Melbournium. 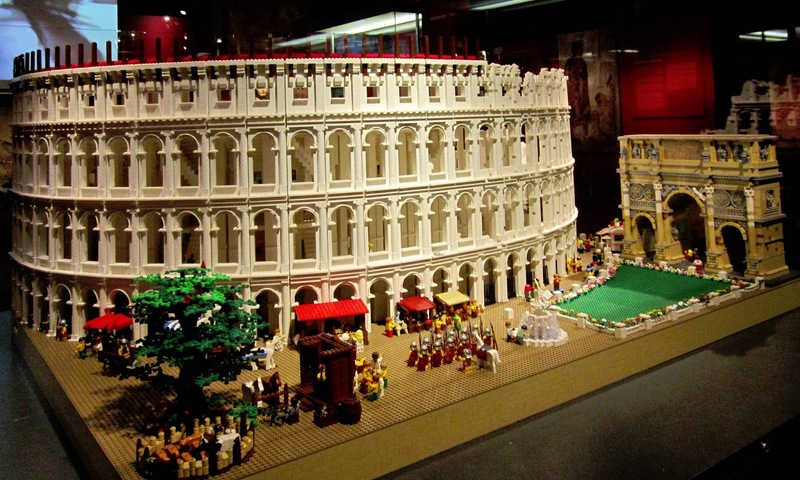 The Legosseum is at the Nicholson Museum at Sydney University. Entry to the museum is free and, if you can find your way to the Quadrangle, it's just inside the southern entrance. I can't imagine how much time it must have taken Mr McNaught to create this marvel. It certainly wasn't built in a day. On four or five trips to the Museum (Did I mention that it's free?) 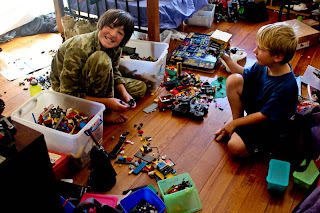 I spent hours poring over the detail and discovering things I'd previously overlooked. There is so much to see both in the building itself but also the people, ancient and modern. 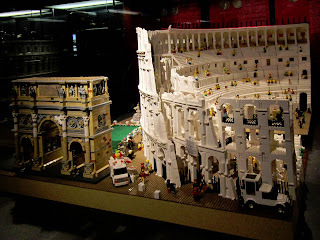 I did enjoy seeing the real thing on a trip to Rome a couple of years ago but I think the enjoyment came more from imagining how life might have been in the year 80 AD when the Colosseum was completed than admiring the ruin itself. And it really is a ruin: over the centuries every bit of decoration that could be carried off was looted and, when that was gone, the site became a quarry and much of the original stonework also disappeared. To stand in a place where emperors and popes stood and where countless people and animals met their deaths for the enjoyment of the people really was a buzz. And so it is too with McNaught's more politically correct creation. McNaught cleverly recreated not just the ruined Colosseum as it exists today but the Colosseum as it would have looked in its heyday, complete with gladiators and Roman soldiers and also modern day tourists..
Next to the Legosseum is a re-creation of the Arch of Constantine, built a couple hundred years after the Colosseum on orders from the Emperor Constantine the Great after his troops won a decisive battle, a battle which---had it been lost---might have hastened the end of the Empire. A good enough reason to build a triumphal arch. 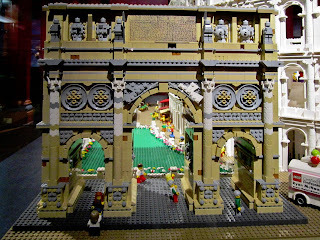 The Lego Arch of Constantine. 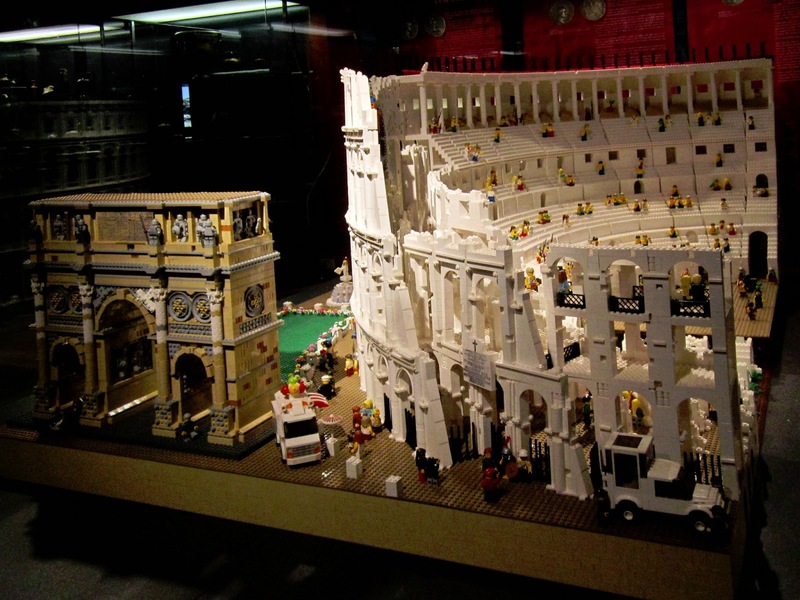 There's a bit of Lego-licence here as real Arch isn't immediately next to the real Colosseum. 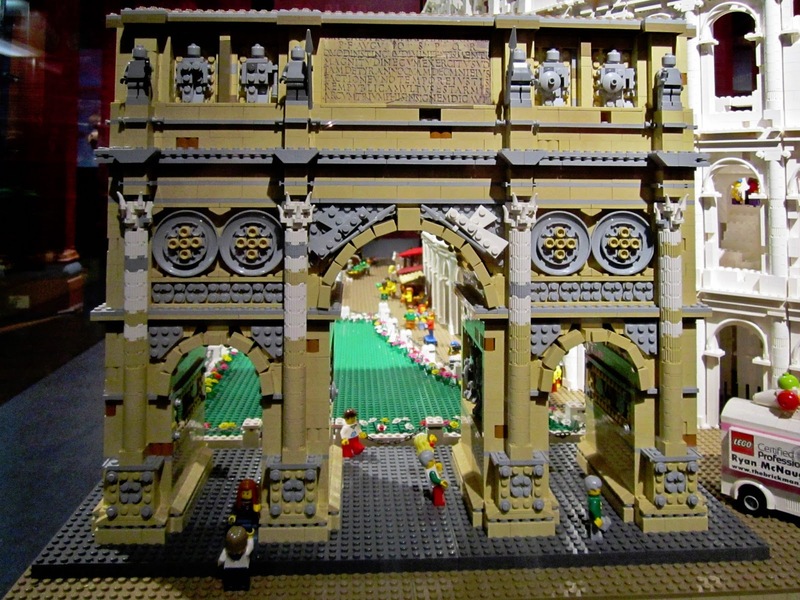 The pre-Lego version of the Arch. Lost to Lego: two young Legomaniacs contemplating their next creation. 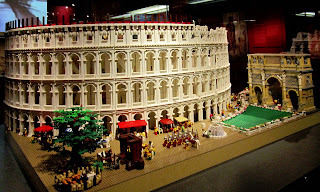 Along with the Legosseum, the Nicholson Museum has lots of displays---static and video---of Roman antiquities as well as their collection of other ancient relics so, even after the Lego is gone, the museum is well worth a look. Despite its small size, the museum it prides itself on having "the largest collection of antiquities in Australia and the Southern Hemisphere." Check with the Museum for its opening hours and then hurry on down.